I think Moms are the coolest people on the planet! Maybe because I am one now. Ha! Seriously though, we juggle motherhood with work, relationships, and just general life stuff. How many Moms do you know who effortlessly heal their kiddos when sick and then tackle the rest of life’s challenges. Yet the Moms I am especially inspired by are those who I have something in common with, you know those cool Moms who manage not to abandon their creative passions. Enter Brooklyn native Jacquelyn Phoenix Soul, a singer / performer, visual artist, jewelry maker, and poet who calls Baltimore home; she is also a birth doula / post partum doula / designer at Buddha Bump. Geez! How does she do it all, I wondered? So I thought, why not include a regular series on the blog where we can hear from Moms like her, and be inspired by their tenacity and determination to live fully? I hope you enjoy our chat as much as I did! We discussed everything from scheduling (you know how she manages to raise such beautiful and bright kids – Cherie-Amor, Dela-Eden and Malachi) to faith and the diversity of her children’s personalities and the rich lessons of motherhood. No one can mother your child better than you… That child has chosen you to come here through. Check out the full conversation here on Sound Cloud . A few weeks ago, my good friend and fellow blogger Michelle Whitney wrote eloquently about creativity and how, sadly, our culture shuns it at every turn. Her post was a response to Jessica Olien’s piece on Slate, Inside the Box. When not writing at Surviving a Creative Life , Michelle creates everything from dazzling tiny ornate hats to yummy applesauce. We are pleased she is our first guest blogger for 2014! 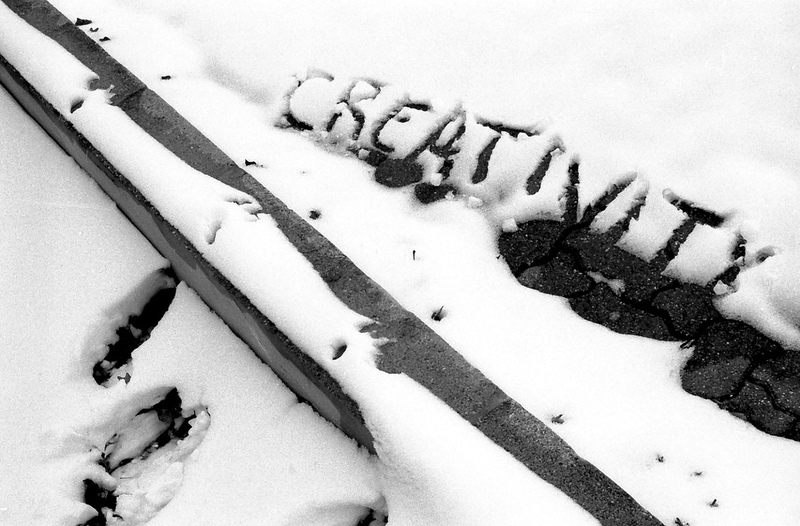 Is your creativity melting away in this 9 to 5 world? Jessica Olein has written an interesting article on Slate about how people say they value creativity, but they really want everyone to jump in line and dutifully follow the status quo, even if it is to the detriment to those who talked the talk about valuing creativity in the first place. I hate to say it, but as someone who lives in the 9 to 5 world, she’s right. I see it almost every day. Ideas for how to manage projects, streamline workflow, and integrate technological advancements are nearly always met with metaphorical brick walls in the workplace. If the ideas are presented from the bottom to the management then they are almost certain to fail or to be dismissed outright without even a friendly ear. After awhile, people become apathetic and stop suggesting creative solutions to problems. The resistance to creative change, even in the positive, is astounding! To survive a creative life we can’t let that apathy consume us. I’ve lost count of how many times I’ve heard, “We’ve been doing it like this for XYZ, which is why we should keep doing it like this going forward.” This is not a reason for doing something if there is a way to improve upon it–especially in our technological world of lightning-fast changes. “Everybody hates it when something’s really great,” says essayist and art critic Dave Hickey. I ran into this myself in a creative writing class back in 1990. I had written a first-person short story from the point of view of a character who dies (not that my story was really great or anything, but who am I kidding, it was pretty awesome for a high-school kid). The character continued to narrate the story from beyond the veil of death. My creative writing teacher insisted that I couldn’t do this. In 1999 the movie American Beauty was released, and guess what–that’s right, the narrator of the story was dead. That movie won 5 Oscars and according to IMDB had 74 total award nominations and 94 wins. Why again couldn’t I write a short story in which the narrator is dead? It’s exactly what Olein is talking about in this article. The story was something new at the time–it was definitely out-of-the-box. My creative writing teacher had quite a bit of jealousy rattling around inside her when it came to my burgeoning writing talent (there were many other issues that made this abundantly clear, but that’s a post for another day…). And just because she had never seen someone write a story with a narrator who dies, she rejected it as an impossibility. And even if our teachers do support us in our creative pursuits and encourage new ideas and innovation in our thinking, what is our current obsession with testing doing to the creative among us? Even if children are lucky enough to have a teacher receptive to their ideas, standardized testing and other programs like No Child Left Behind and Race to the Top (a program whose very designation is opposed to nonlinear creative thinking) make sure children’s minds are not on the “wrong” path, even though adults’ accomplishments are linked far more strongly to their creativity than their IQ. I’ve had long conversations with a teacher-of-the-year friend of mine about No Child Left Behind and how it leaves no room for creativity in its curriculum demands. We also talked about direct instruction (mostly experimented with on low-income children, of course) being the same way. We’re teaching our kids only to follow directions and stay within the lines. Teaching a test is not teaching problem-solving, which is something that life requires of all of us. Problem-solving often involves finding creative solutions to complex issues. You can’t learn this by picking A, B, or C on a multiple-choice test. Michelle Whitney creating art. Photo courtesy of the author. Michelle was born a creative genius (really, I swear!). Okay, maybe not a genius, but definitely creative. She works a stressful 9-5 that is creative-adjacent, but lacks in actual creativity. In order to survive this situation while still being able to pay her bills, she seeks to find the creative in situations all around her. It’s a survival tactic, because surviving a creative life is not always easy and often it makes you question yourself down to the very fibers of your being. Michelle is a trained writer and photographer and an autodidact in just about anything else she can get her hands on.